Boy, are we excited around here! The kids finished their last day of school with great science reports and now we are officially into summer vacation. I do still keep them reading everyday and writing book reports once in a while. We also do a few math pages each week. I think it really keeps their minds fresh and we are not so rusty when September rolls around:). my kids running, playing, OK...riding loud dirt bikes...but having fun! I know some of you may not, but why not make a cozy spot in the yard to sit and relax? It could be out your back door, near a garden, or under a tree. The invitation to sit and talk, relax, spend time just connecting is priceless. OK, I am going to be brave and show you our front porch. It is nothing spectacular, but I am grateful for it! The chairs were a yard sale find and I just painted them white. My sister found the little wicker table for me, and Tim and I spray painted it yesterday. I made the bench years ago. It came out of our bedroom. Moving furniture around is about the cheapest way to change the look of a room. The fan was another yard sale find and is perfect for the porch. The jar was my Great Grandmother's...don't lilac's just pop in blue Ball jars? Oh my, you just have to try Alyssum. Their fragrance is intoxicating and they last all summer long. I hope you find a place to make your personal spot to relax this summer and truly enjoy those around you! ENJOY your day....make it a happy one!! Linked to Life Made Lovely. Summer is fun when your kids are young. So much time for fun things. I will be with all 6 of my grandkids in a few days.....alll under the same roof.......so excited. Love your porch and that fan. Have a great summer. Your front porch is gorgeous! I love every bit of it. Summer vacation doesn't start for my kiddos for another week, but like you I'm going to make sure they keep reading every day and I'll be making them little math assignments too to keep their minds fresh. That's what my mom did for me too and I think it really paid off! Visiting from LML . I love your porch, what a greta spot! My porch is in need of a make-over and that is on my list for this week or next. My mom just found me two whicker chairs at a rummage sale so I need to paint them and then I am looking for a table to go with them. I agree, moving furniture around is the best and cheapest way to decorate! 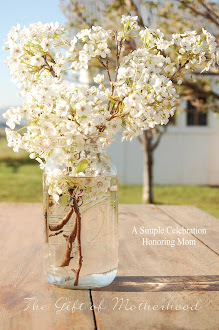 I love Ball jars and especially ones filled with lilacs--my favorite! I think it IS spectacular. I love it! Julia, I'm not quite sure how that took much bravery. ;) Your porch looks so lovely and inviting! And that fan is perfection. I still can't comment with google and blogger. loving your porch. Looks so cozy and relaxing. Love your porch! Thanks for the inspiration!! Oh my goodness, I think I could actually feel my heart pounding in my chest! I LOVE these pictures of your porch!! So dreamy and relaxing! Thank you for sharing this!! Very Inspiring! I love your front porch! I'm working on my back porch now....trying to cozy it up. What a lovely blog you have! Your porch is so very welcoming! I am enjoying looking around your site...those philly sandwiches look delicious! Thank you for the inspiration that your posts give! I wish I could sit down with you have that cup of tea and relax on your cozy porch/veranda. And I feel truly grateful that you shared with us a peak. Have a wonderful day Julia! By the way I love the set "new" set-up of your blog! Looks roomy and organized! Julia, I am new to your gorgeous blog! Your porch is wonderful. I will bring the ice tea if you provide your fabulous porch. Wouldn't it be fun to sit and chat? But not for long, because I'm off to see some of your other creative and interesting posts! I am a new and happy follower! Hi, I'm visiting from Pennington Point. Your porch is absolutley gorgeous. We're here on an island in the North of Scotland, so sadly, no 'porch living' for us. As for needing a fan outside?!!..... sea 'breezes'/gales do that for us! Loving your site, and gonna call back to get to 'know' you better! I love your porch! So cozy and inviting. Did you make your pillows? The material is exquisite. Thank you for sharing! Love your front porch. There is nothing better than sitting on a comfy porch and reading on a beautiful day. Beautiful porch...I love porch living. Your home is lovely.